This recipe is quite a treat. Andrew and I were in NYC a couple of weeks ago and ate at The Gramercy Tavern for his birthday dinner. We had the vegetarian tasting menu. 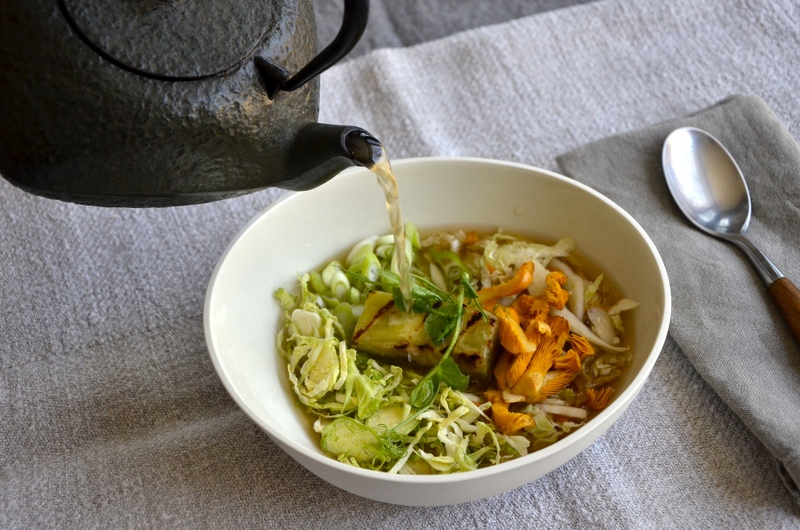 The main course was this simple but powerful smoked cabbage soup with raw vegetables and grilled Japanese sweet potato – or satsumaimo – unlike any soup I’ve eaten before. Lo and behold, we were invited into the kitchen at the end of dinner to meet the chef and we were given the broad outlines of the recipe. I’ve looked all over for a similar recipe and I can’t find one. So, you saw it here first. I have to admit that theirs was better but this one’s pretty damn good. Preheat your BBQ to high. Add hickory (or any fruit wood) in a small smoking box to create a home-made smoking oven. Add the quartered cabbage and grill on all sides. 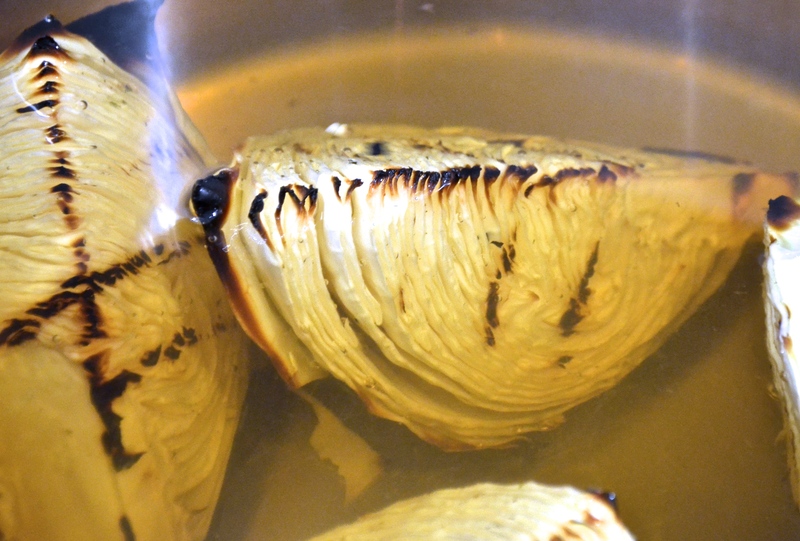 Once it’s nicely browned, turn down the heat to low, salt the cabbage well, and smoke the cabbage for approximately 2 hours until it’s super tender and smokey. Leave the BBQ on low heat. Meanwhile, heat olive oil in a large stock pot. Sauté onions until carmelized. Add garlic, minced ginger, and chili flakes and sauté for another 3-5 minutes until garlic is fragrant. Add vegetable stock, soy sauce, and smoked cabbage. Bring to a boil then turn down and simmer for approximately 45 minutes until the flavours meld. Strain and finish with the vinegar and salt and pepper to taste. Keep piping hot over the stove. While your stock is cooking, prepare the satsumaimo sweet potato by peeling it and cutting it into large cubes. Brush with a little olive oil and grill in the BBQ on low heat until soft and charred on the outside. Prepare your other vegetables and place them in the bottom of large soup bowls. Add the grilled satsumaimo. Finish with some tender shoots. 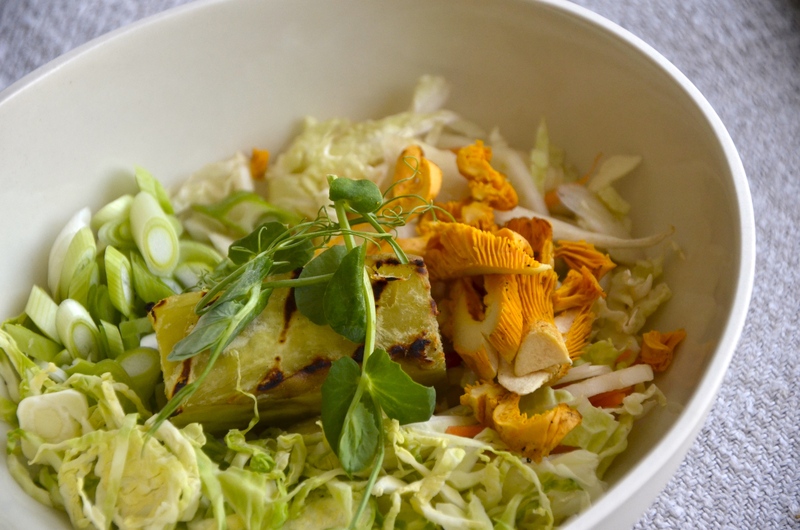 Place vegetable bowls in front of hungry eaters and when everyone is seated and ready, pour smoked cabbage stock over the vegetables to the sounds of “oooohh” and “ahhhhhh.” Feel the satisfaction.